RARE - STONEWARE LARGE BASKET WEAVE PLANTER by PFALTZGRAFF. It was DISPLAYED by a Collector but Never Used. Because of this policy change, once a claim has been opened, we have no choice but to wait for a decision from the Resolution Center. For Your Consideration from my own personal collection by Pfaltzgraff in the Tea Rose Pattern, I have a Beautiful Oval Wicker Handled Basket. Displayed in the China cabinet only. Excellent Condition. Pfaltzgraff TEA ROSE Embossed Basket Covered Deviled Egg / Dip / Bowl- Mint! Pfaltzgraff TEA ROSE Embossed Covered Basket Sugar / Dip / Trinket Bowl. This is actually the bowl to the deviled egg platter. Made in China. Vintage Tea Rose Basket Votive Holder - VGC. Shipped with USPS Priority Mail Medium Flat Rate Box. Beautiful tea rose basket weave plates. This includes a 12 3/8" Bread Basket Tray and 2 of the 7 1/4" basket bowls. Excellent condition no chips or flaws. Item has never been used or displayed and the box is included. Sale is final. This is in very good shape it is 12 3/8 x 6 1/2. Beautiful Pfaltzgraff Tea Rose Ceramic Basket. Excellent condition. Appears Unused. Stands 8" to top of handle. 2 Pfaltzgraff Tea Rose 7 1/4" Basket Weave Bowl - . Shipped with USPS Priority Mail. Both in excellent condition, no chips or cracks. RARE VINTAGE PFALTZGRAFF TEA ROSE FLOWER BASKET TRIVET. Pink and green flowers in a woven basket with a raised feel to the flowers. No chips or cracks. One of the little pads on the back is half gone(see pic). Measures 8 3/4" by 9 1/4". Shipped with USPS Priority Mail. Please email with any questions, Thank you! This is very nice it is 7 x 3 in size. Set of 2 Pfaltzgraff Tea Rose Sandwich Plates Basket Weave 7-1/4"
It does have a large flower with a broken petal and a small flower with a broken petal. Over all very good condition. Up for your consideration is this RARE and VERY HARD to find Pfaltzgraff Tea Rose Flower Basket Trivet. It is a beautiful feature of pink and green color of flowers in a woven basket with the raised feel to the flowers. This is very nice it is 7 1/2 x 8 in size. Pfaltzgraff~Tea Rose~Perennials~Bunny & Carrots~Embossed~Basket Weave~Casserole *EXCELLENT CONDITION* *PLEASE MAKE NOTE* that the photographs are part of this item's description. See Pictures for More. Good Condition. I believe this is the Tea Rose pattern. It has a basket weave design. Pfaltzgraff TEA ROSE Basket Weave Round Stoneware Bowl 8.5 Inch Rare! MINT! USA! Pattern: Tea Rose. Miscellaneous Info?. : Rare version. Manufacturer: Pfaltzgraff. Piece: Bread Basket Tray. Pattern: TEA ROSE. Helpful Links. Canadian and international orders. U.S. Expedited. Pfaltzgraff Tea Rose - basket bowl. In very good used condition. For sale is aPflatzgraff Tea Rose Bread Basket Tray. 12 3/8" long x 6 1/2" wide x 1 1/2" high. Here is Pfaltzgraff Tea Rose oval shaped bowl in a basket weave pattern with a removable rattan handle. It is both dishwasher and microwave safe.Made in China. Great condition. No major crazing, cracks or stains. Slight wear on the bottom rim with a tiny chip on rim. Tea Rose Bread Basket Tray with decals and basket weave. Pfaltzgraff TEA ROSE Covered Ceramic Basket Candy Dish Bowl Charming! This charming dish in the shape of an oval basket of flowers is from the Tea Rose pattern by Pfaltzgraff, first produced in 1985 and ever-popular. Overall size is 5" long, 4" wide, and 4.5" tall. Part of the interior edge of the lid has turned brown with age but otherwise both dish and lid are in beautiful condition. Pfaltzgraff Tea Rose basket weave bowl 7 1/4"
Pfaltzgraff tea rose hard to find basket weave napkin fold over (on both sides) oval UTENSIL HOLDER. It is about 7" tall x5"x4" ovalish opening. made in the USA (utensils shown are NOT included). Most of my pieces are made in the USA with an exception of a few made in china. Pfaltzgraff Tea Rose pattern - Bread Basket Tray - 12 3/8" L X 6 5/8" W Excellent condition. No chips or anything. From a smoke free home. 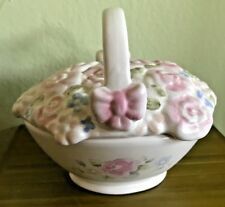 Pfaltzgraff Pink Speckled Ceramic Easter Basket 6" High 4 1/4” across top of the basket.Pre-owned. See pictures for a small chip around top. Chip blends in with the speckles so it’s hard to see. Just wanted to make one aware of chip. Manufacturer: Pfaltzgraff. Piece: Basket Bowl. Pattern: TEA ROSE. Canadian and international orders. U.S. Expedited. WICKER BASKET WITH WEAVE REMOVABLE HANDLE. 9.5" OVERALL, 4" TO TOP OF BASKET. Pfaltzgraff Tea Rose Fruit Basket 8" across approx. Pfaltzgraff Tea Rose basket in great condition. Approx 8" tall and 11 1/2" wide. Pictures make the pink look darker than it actually is. It's a light pink. Has one flaw on rim shown in pics. Paint isn't on one ruffle. Pfaltzgraff Remembrance woven basket bread tray, measures 12 1/4”L x 6 3/4” w x 1 1/2” h . No chips or cracks noted. PFALTZGRAFF TEA ROSE. BASKET WEAVE BOWL 7"D 3"H.
Pfaltzgraff Tea Rose Bread Basket Tray.